1.Open the stack called "stack to align.tif" (download it here). You can see that it composed of several images of similar patterns but not well aligned. 4. After making a square ROI on the image stack, click on OK.
5. All the slices in the stack will be aligned, and the displacements for each slice are printed out in both log window and results table. The selected landmark (ROI) will be searched against the whole image if this value was set to 0 (by default). Otherwise, the landmark will only be searched against an area around the defined ROI (size of the searching area will be "ROI+the entered pixel value"). Implement a Gaussian peak fitting algorithm (adopted from the JPIV package), so that the location of the correlation peak could have subpixel precision. 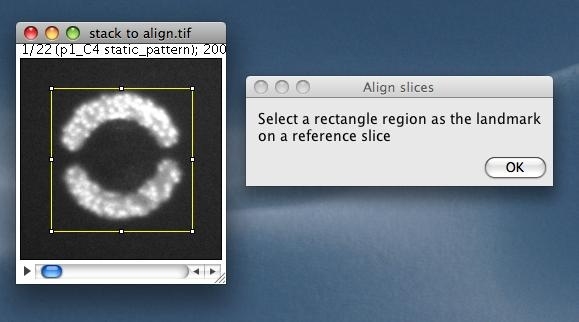 Subsequent subpixel image translation was done by ImageJ's native translation function with bilinear or bicubic interpolation method.